One thing I don't do enough of is read some of the better fly fishing literature out there. In fact, I don't read a whole lot anymore about fly fishing in general, but that has mostly been a product of trying to keep my grades up in college. All my reading that is not related to classes has fallen by the wayside. Thankfully school is out for the summer and just in time I was contacted about reviewing John Gierach's new book, "Fool's Paradise." I jumped on the opportunity and just received the book yesterday. One day and 211 pages later, I'm left wondering where all my time went. This book was a relaxing down to earth read that was easy to relate to. 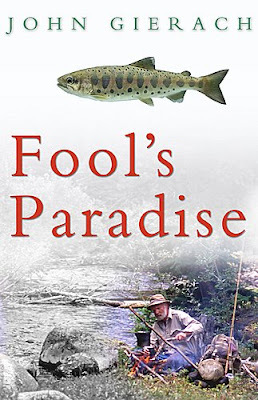 I have to admit that this is the first of his books that I have read, not because I don't like his writing, but because I just haven't bought many fly fishing books in general. That has been a mistake. For years I've heard people discussing some of Gierach's books and the general consensus always seems to be that the guy can write. "Reasonable and prudent" was the only daytime rule, although I do remember once riding in a pickup that was stopped by a cop who asked, as if he were just passing the time of day, "Don't you guys think a hundred and there is a little excessive when you're towing a drift boat?" We explained that we were going fishing. He asked where and we told him. He wished us luck and told us to "Just take it easy." There's got to be a good cartoon that could be made from this, and if I was half the talent as an artist that Gierach is as a writer I could probably make something pretty hilarious. One of the most refreshing elements of the book is the lack of detail on where some of his greatest fishing memories were made. In a day when kiss and tell articles sell major fly fishing magazines, it was a special experience to read a fly fishing author that honored the age old tradition of maintaining silence about a great place to fish when asked to keep quiet by the guy showing him the river. His stories remind and inspire that yes, there really are still places were big dumb trout are the norm...places that are still pristine and bull trout can still be caught without having a federal ranger appearing out of the brush to haul you off to the penitentiary for targeting an endangered species. He also shows that he is just as crazy as a fly fisher can be, telling about fishing when it is excessively cold outside on one of those days where you start to wonder what exactly it is you are trying to accomplish or prove. Stories like this can be understood by just about any diehard and at least admired by the more lazy fisherman who only come out when it is warm. One of my favorite chapters was called The New Guy. It brought together all the elements of fishing with a new potential fishing buddy including the telling of all your best fishing stories that everyone else in the group has already heard plenty of times. Best of all, the new guy in question was Jim Babb who is of East Tennessee origin. Making it even more personal was the fact that his brother Walter Babb is the guy that taught me how to fish nymphs in our Appalachian mountain streams. I have an Barnes&Noble gift card from Christmas that I haven't used yet...perhaps I'll check it out. I'm not a big reader when it comes to paperback. My eyes stayed peeled on your website amongst a few others. However its amazing what the word of mouth factor is worth! I'll be picking this one up shortly! It helps when the author is one of the founder's to the word "Trout bum!" Cheers on your read, hope I'll be doing the same soon! PS-Dude we have got to get on the caney for a drift! Very Very soon! I'm thinking this weekend or the weekend after??? ?